During the holidays, we all get wrapped up in things that are potential distractions from finishing. Failing to finish is all too common. If you’re an attorney or law firm marketing professional, it’s time to wrap up your week, your quarter and your year. Look, everyone, there are still a few weeks left in 2014. That is plenty of time to accomplish so much before year’s end. I know you hear people saying that “Nobody is doing business this time of year,” or “Everyone is on vacation and gone from the office, so what’s the point?” The point is they are wrong. I know I am still working. Are you? I thought so. Most successful people are still working. So, before you let yourself fall victim to any of those excuses, commit to finishing your year. 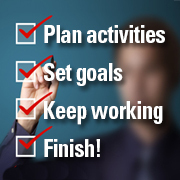 Here is the year-end checklist to keep you on track and help you finish strong in December. Plan your holiday activities. By now, you should know what parties and events you are potentially going to attend. Make sure you schedule those just like any other appointment. You know which ones you really want to go to and which ones you can’t miss. Put them on your calendar. Set your goals. If you have not done so already, it is time to plan your next year. Carve out several hours from your schedule to do this, maybe an entire day. You will be glad you did. What do you want to accomplish next year, in three years or five? What will roll over from this year to the next? Set your goals, and write those puppies down. This process is critical and should always be a part of wrapping up your current year. We all need to know the direction we’re headed in. Keep working. Whether on the phone or in person, make more calls. Both current clients and potential clients need to hear from you. Better yet, they need to see you. Go to the holiday parties and open houses. Have fun and (re)connect with people. ’Tis the season, after all. And who knows? You might even bring in some unexpected new business. I tell all my clients that one of the best strategies for getting ready for next year is making calls in December to schedule appointments for January. Finish! Wrap it up. Just as you wrap up your week each Friday, let December be the month of wrapping up your year and planning on your next one. Don’t fail to finish. Many happy financial surprises could be waiting for you at the end of the day. Enjoy the holidays. You know what to do here. Cheers! Don’t give up on 2014. There are just under four weeks left. So much can still happen. If you have not reached your goals for this year or want to blow past them, it is time to focus and redouble your efforts. Make more calls. Drop by your clients’ and prospects’ offices. Of course, take cookies or whatever your client appreciation gift is for the holidays. Imagine the impression and impact that will make. Imagine the conversations that will happen. And … it’s a wrap. Joan Richardson is an executive business coach and business operations consultant based in Dallas, Texas. Joan works with professional service providers and business owners, on generating business, streamlining efficiencies, process improvement, operations and systems effectiveness, as well as providing custom coaching sessions. (Joan@JoanRichardson.com and @JoanCRich).